ALL of these competitions require the fencer to be a registered member of British Fencing. Ask a Andrew to email you an entry form. 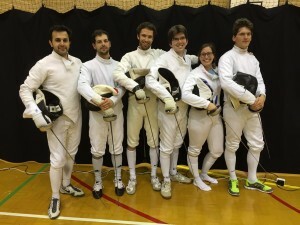 On 22 March Blackheath epeeists took on Gravesham in a friendly club match for the first time in a couple of years sending two teams from its growing group of epeeists. The A team comprising Gurlal Jagdev, David Antonopolous and Alister Smith won 45:41 and James Williamson, Marlene Sturm and Christian Gucklesberger formed a B team which narrowly lost 41:42 after running out of time. All enjoyed their visit and thank Gravesham for the invite and hospitality. A return match will be arranged soon! The Club championships started in 1977 one year after the club became independent of local authority funding having started as an evening class in 1963. There have been a few gaps in the competition most notably between 2002 and reinstatement in 2011, when the club membership was somewhat smaller than it is now. There were trophies for each weapon but the sabre has gone astray over the years. The Mens’ Foil shield (Geoff Roche Trophy), Mens’ Epee (I think it is, its just called the “Roan Fencing Championship” but has an epeeist on the badge) the Ladies Rosebowl (foil) and the Master at Arms Cup (awarded for best overall fencer at all three weapons) remain albeit in need of refurbishment. As ladies were not allowed to fence epee or sabre until relatively recent times there are no trophies for them at present. The Master at Arms cup was won in 1996 by no less than Andy Pavaday, recently appointed as our Head Coach and refereeing today! 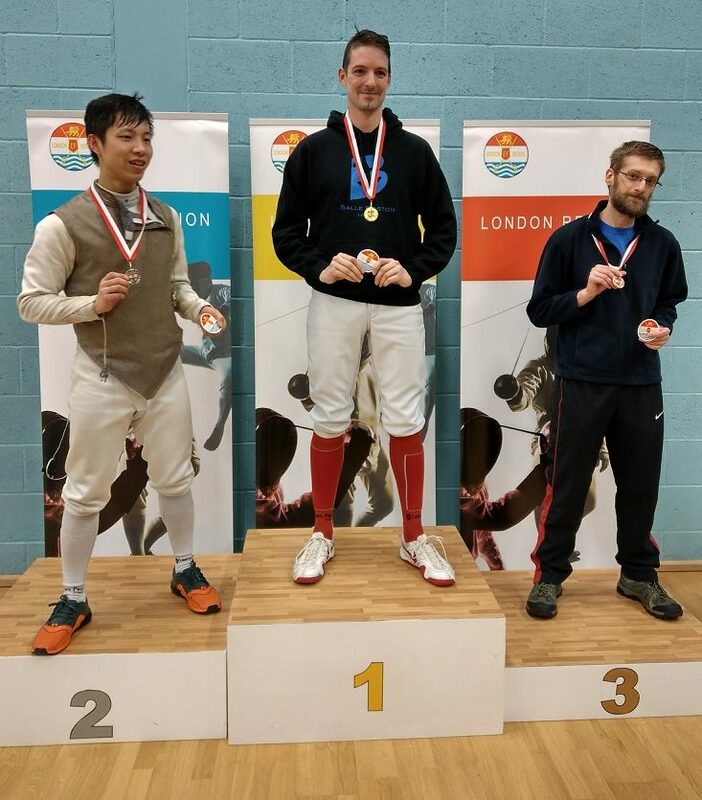 This year we had a Mens’ Epee competition and a Mixed Foil Championship with special awards for best beginner, best junior (as some had turned up for the cancelled Musketeers Championship) and best Intermediate (fencing under 1 year). Our Club Coaches Stephan Munn and Andy Pavaday very kindly came along to referee for us, even though Andy had not done foil reffing for some years! The epee was closely and energetically fought (if the shouting was anything to go by) with a pool round followed by the usual Direct Elimination (DE). Ben, our Chairman, was on form in the pool round taking an early lead against the favourite Alex, who, also being beaten by James Williamson, had to be satisfied with 3rd place in the rankings. Ben taking 1st and earning a bye into the DE 2nd Round. In another trend against the pool ranking, 4th place James Cross then beat 2nd ranked James W in the semi while Alex came back strongly to beat Ben in the other semi. The final battle between James Cross and Alex was close fought with Alex seeming to fade in the final stages as James went ahead to win. 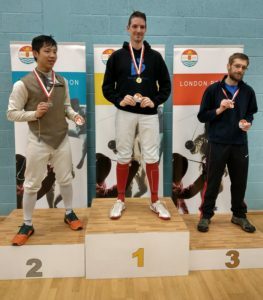 Gabor started fencing in our Summer beginners class and recently moved to epee while Steve was a member until earlier in the year when he moved to north London and was an invited guest as he is clubless at present. With a shortage of female fencers in recent years, many competitions are now run as mixed events. 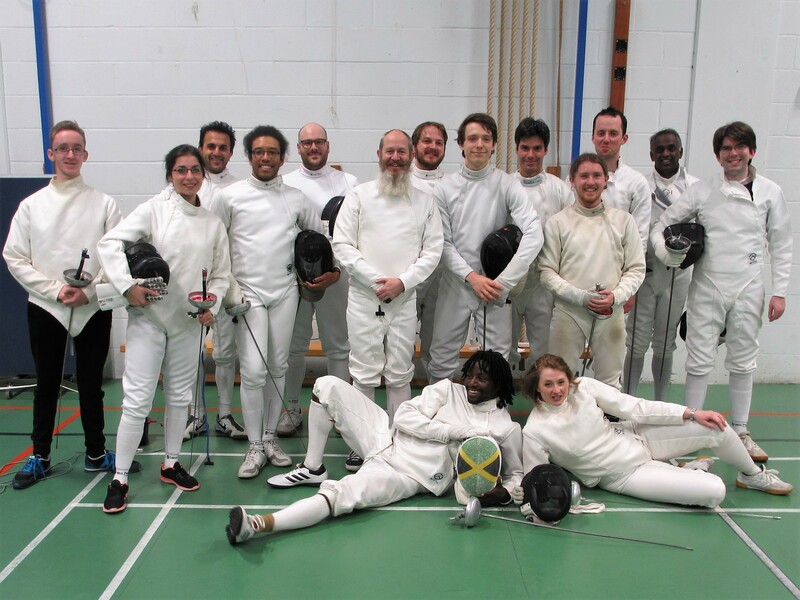 We then add several sub categories such as best beginner, best intermediate etc., to liven it up and encourage less experienced fencers to take a thrashing join in in the name of experience! 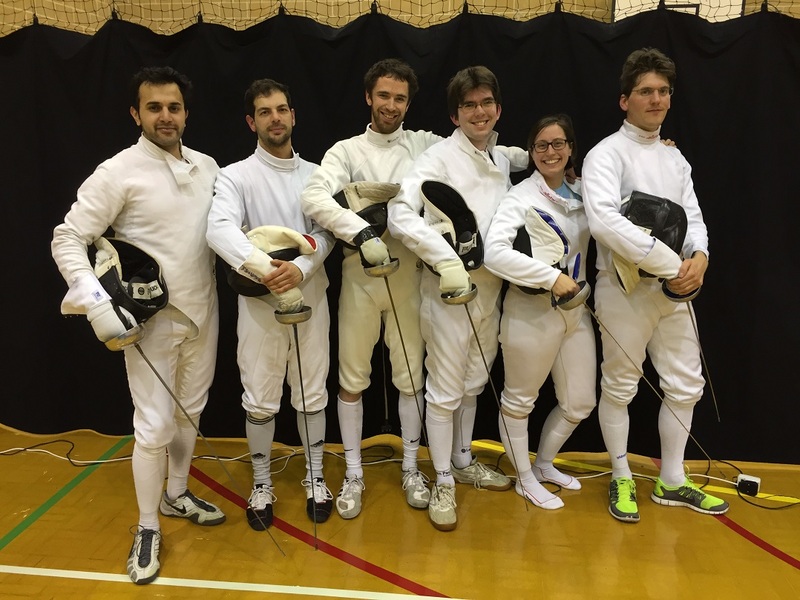 This year we had one of this term’s beginners (Natalie), seven seniors and older Musketeers (Felix, Jordan and Sofiya) whose morning competition had to be cancelled due to lack of entrants this year and who asked to enter the seniors at the 11th hour. (Brave souls but well done). There were two rounds of foil, the first with a random selection of ability in each with the top three from each pool forming a ‘Leaders’ second round pool and the remaining 5 a second, ‘Intermediates’ round pool. In Round 1 Pool 1 Malgosia took 1st place with 5/5 victories, Andrew 2nd with 4 victories and Guilia (a new member) 3rd with 3. Dave, Eva and Sofiya coming up behind. Round 1 Pool 2 was led by Helen 4/4, followed by Lee 3 and Musketeer Jordan 2 with Felix and Natalie in the lower places. In the 2nd Round Leaders pool there was something of an upset as it was won by Giulia 4/5, who defeated both Helen 3 and Malgosia 2 (and who both defeated Andrew 2, who couldnt hit a barn door that afternoon) but was herself defeated by Andrew 5:1! Just showing how individual fencing styles can make such a difference. Giulia originally learned to fence in her home town in Sicilly and joined us recently after a four year gap so a good day for her. In the ‘Intermediates’ 2nd Round pool Musketeer Felix and Eva both took three victories with Eva winning on indicators by a clear 7 hits despite Sofiya nearly foiling her result (pun intended…) beating her 5:2 to take her only victory! All round a good, fun afternoon’s fencing with guests Sam(antha?) and Giulia’s father, visiting from Italy, helping to consume the tea and coffee and Gabor’s son (age 7) testing the biscuits. Most of the older fencers and referees then retired to The Standard for further refreshment to round off the day. This turned into a slightly extended session as the road works blocked the exit from the pub car park for a while. Such a shame! Medals and Certificates will be presented as soon as possible and some photos should be available soon too. Those entering the Individual comp will be seeded into teams for the Team Comp. Teams not in the Individual will be seeded in based on previous competitions. Times will be confirmed subject to number of entries. Seniors: 1st, 2nd, 3rd in each weapon plus Best Female (or best Male) if not in top 3. Best Male and Female fencers under 3 years fencing, Likewise Best M/F beginner under 1 yr and Best M/F from current training classes. Musketeers: 1st, 2nd, 3rd plus Best male and female fencers under 4 months training, Most Promising Male and Female Fencers. Cash vouchers for fencing equipment. A glitch in WordPress is preventing the upload of files at the moment. Please ask Andrew for details. Three of our 5 entrants to the 2012 Kent Junior Foil competition took home medals this afternoon (20th May). Tom Bevan took Bronze in the Boys U14. This was the first proper competition for both Tom and Sofiya who can be proud of their achievements. The other two entrants in the boys U12, Peter Tsirushkin and Sam Fruen (also in his first comp) both got through to the second round of the DE before being knocked out. The boys displayed commendable camaraderie as they supported each other through the comp especially Alex who had a difficult final against a strong opponent. Sofiya earned respect and friends for the way she determinedly pushed through a difficult and rather painful early round fight against an inexperienced fencer and there were words of praise from coaches for the other boys too. A great day and a great result for our Musketeers.